The National Wild Horse & Burro Advisory Board has recently reaffirmed that no public input or comments submitted to the Board will be published in their meeting minutes or made available as part of the public record. Without making the publics concerns, comments or issues raised available for others to see, those interested in wild horse and burro management find their submissions disappear into a vacuum, never to be seen or heard from again. Because of this, the Board lacks any accountability towards meaningfully addressing those issues. In efforts to provide a more even playing field, American Herds offers you the opportunity to publicly post your submissions to the Advisory Board. Just send your comments to american_herds@cox.net and specify which Advisory Board Meeting you submitted them to and American Herds will happily post them for you. However, despite Mr. Stebleins' apparent concern over the "flaura & fauna" of Nevadas Rangelands, after yesterdays WH&B Advisory Committee Meeting, it is apparent that its not REALLY about "protecting the land" anymore either, but about "resource development." The BLM does NOT consider our wild horses as resources. Therein lies the problem. The BLM is ALL ABOUT LAND and "resource development," and what is land these days but a "rescource" and a very valuable one at that. 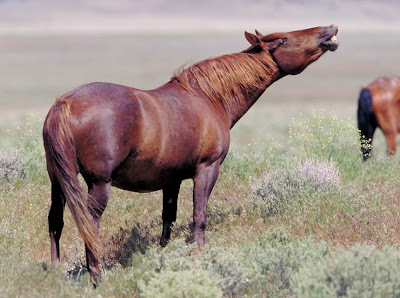 The wild horses are a liability to the BLM and its plan for "resource development." Not only are the horses in the way of the six-million cows that are grazing on their lands (for a measley $18. per year!) but they are also in the way of mining permits and operations, BIG Game Hunting and permits, but now they are in the way of "resource developmemt." And just what is "resource development," you may ask? One of the speakers at yesterdays meetings admitted that "its all about" resource development. She said that some of the ranchers are giving up trying to eek out a living ranching and are selling off their privately owned lands to developers. The speaker boldly stated that the surrounding lands nearby these new development areas are worth "far more" for development than could ever be worth for ranching! So the BLM is into "building communities" now, or would like to be? How nice for the Powers-That-Be, (PTB) but not so nice for the American public or the horses.